Support me in the fight against cancer! Every dollar counts! Please consider a donation. Cancer tries but we TRI harder! In March of 2017 I was diagnosed with Invasive Ductile Carcinoma, a form of breast cancer. I was only 33 years old. I started 20 weeks of aggressive chemotherapy a few short weeks later. I lost my hair, my eyebrows, my eyelashes, my energy but I never lost my spirit and fight for life. In July of 2017, as I was closing in on the end of my chemotherapy treatments I stood on the sidelines of the Tri for A Cure and watched as my friends competed and supported the very thing that was trying to kill me. I hugged so many women that day and I left with a huge sense of hope for my future. 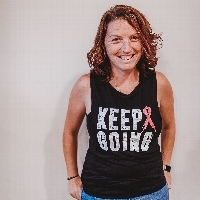 2 months later I underwent a double mastectomy and then received the news that everyone is waiting to hear, “the chemotherapy reduced your tumor by 95% and we took the rest out in surgery. You are now in remission”. In May of 2018 I completed active treatment and am now in the maintenance phase and being closely monitored for any reoccurrence. Last year was my first time completing the Tri For a Cure and I did so with my ENTIRE oncology team cheering me on which was the best gift I could have been given. This year, I GET to compete in the Tri for a Cure for the second year as a SURVIVOR and I am so excited to get out there again and fight this fight. Thank you for your support and take a quick minute to watch this video filmed by Greg Emerson.